Early pictorial map of London, England. Geographia Pictoria Plan of London. 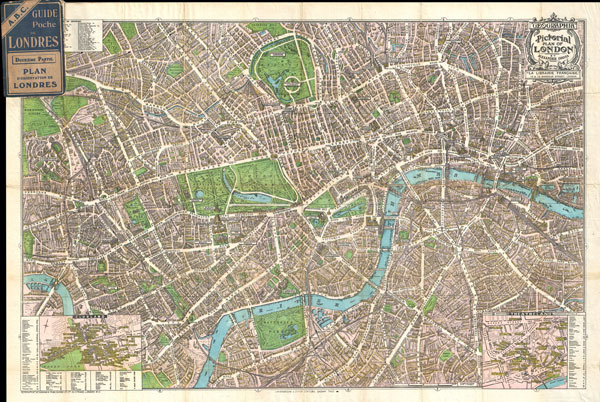 This is a wonderful map of pocket map of London and published c. 1924 by Geographia Ltd. Covers downtown London from the Hammersmith Bridge and Wormwood scrubs eastward past Hyde Park and Buckingham Place to Whitechapel Road and the London Docks. Unlike most English city plans of the period, this map replicates the pictorial style which popular in Paris during the early part of the 20th century. Features many of the buildings of London drawn in three dimensions. Insets in the lower right and lower left depict Theaterland and Clubland, respectively. Both insets detail individual establishments as they existed at the time including the Ladies Automobile Club, the Athenaeum, the Palace Theater, the Hippodrome Theater and the Coliseum Theater, among many others. Notes stations on the London Underground. This map was part of the 'La Librarie Francaise,' a guidebook series geared toward French speaking tourists. The accompanied by a two part pocket guidebook entitled A. B. C. Guide Poche de Londres. Published in London at 16 and 18 Wardour Street by Geograhpia Ltd.
A.B.C. Guide Poche de Londres, Librarie Francaise, London. Very good. Minor tape repairs to verso. Original fold lines. Folds into original booklet.